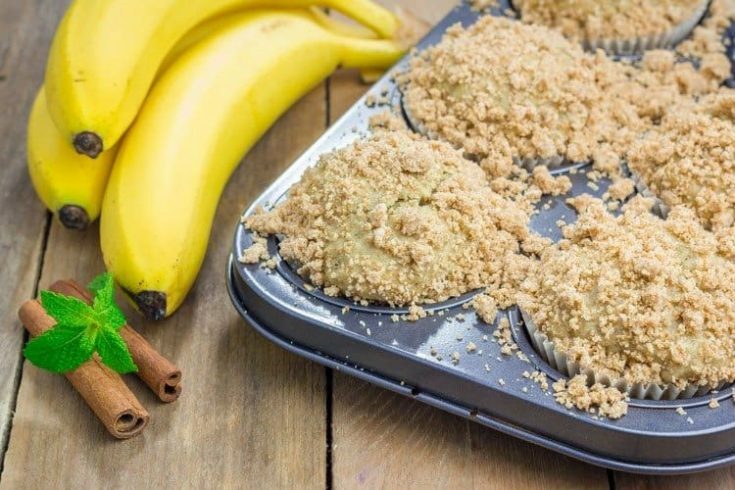 We just made this amazing banana bread with streusel topping (well, muffins actually–but you could totally make it into bread) after school today, and let me tell you: It is certainly kid approved! The best part- the streusel topping. The Bread- 1/2 cup butter or margarine 1/2 cup sugar 1/4 cup brown sugar 2 eggs 6 soft bananas, all squished up in a plastic bag 1 teaspoon vanilla 1 3/4 cups flour 1 teaspoon baking soda 1/2 teaspoon salt Preheat oven to 350. Mix together the butter and sugar until smooth, and then add the eggs, smashed up bananas and vanilla. Blend until mixed together really well. Next, in a separate bowl combine the dry ingredients. While the mixer is still on, slowly add the flour mixture and mix until smooth. Spray a loaf pan to prevent sticking. Recipe makes one loaf. Pour banana bread batter into the loaf pan and set aside. The Streusel (makes enough for 2 loaves of bread)- 1/4 cup sugar 1/4 cup brown sugar 1/2 cup flour 3/4 teaspoon cinnamon 1/4 cup butter or margarine melted. Drop spoonfuls over the banana bread batter. Mix together the butter and sugar until smooth, and then add the eggs, smashed up bananas and vanilla. Blend until mixed together really well. Next, in a separate bowl combine the dry ingredients. While the mixer is still on, slowly add the flour mixture and mix until smooth. Spray a loaf pan to prevent sticking. Recipe makes one loaf. Pour banana bread batter into the loaf pan and set aside. The Streusel (makes enough for 2 loaves of bread)- 1/4 cup sugar 1/4 cup brown sugar 1/2 cup flour 3/4 teaspoon cinnamon 1/4 cup butter or margarine melted Mix the ingredients together. Drop spoonfuls over the banana bread batter. Bake for an hour at 350 degrees. Enjoy- it won’t last long! Adding sour cream and vanilla sounds like a great idea. I’ll have to try that sometime. I’m so glad you enjoyed the recipe. Quick question: How it look if I add walnuts as toppings?Love to know your thoughts…For me this recipe is yummy! I have a question, there is only my husband and I . We have 5 grown kids ,8 grown grand kids. In Ga. We have 3 great grand baby’s all under 3.all live in Ga. They have small children so they won’t come and see us. My husband is 74 and I’m 62 too long of a way for us to drive. Hi Dianna! Yes, you should be able to freeze the second one. I haven’t done it with this specific recipe but have had great luck doing it for others. Thanks!